Student Association President Andie Dowd and Executive Vice President Casey Syron have proposed several upgrades to the 4-RIDE portion of GW's official app and hope to involve students in the School of Engineering and Applied Science. GW’s app is getting a makeover. Student Association President Andie Dowd and Executive Vice President Casey Syron hope to create a new app for 4-RIDE, which they said would replace the current feature on the University’s official smartphone app that student leaders also hope to revamp. Dowd said the new 4-RIDE app would allow students to track the location of their vehicle, similar to how the popular car service Uber’s app works. Dowd said the changes to the GW app were sent to University officials and are in the process of being finalized. Dowd has been working with Tim Wood, an assistant computer science professor who has helped to create apps for the University in the past, to work on the app’s interface and recruit students to help create the software. 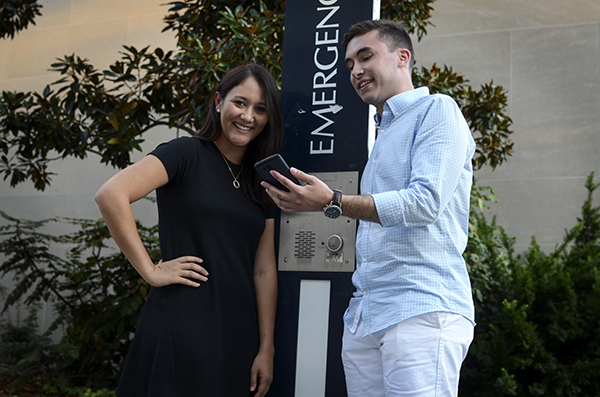 Wood helped create the GW PAL app, a campus safety app students can use to send anonymous tips and call for the University Police Department. He said that the 4-RIDE app will be one of a group of projects that seniors in his class can pick to focus on as their senior design project. Wood added that the 4-RIDE app could be a prototype to bring to administrators later in the year, or a project a senior takes on after graduation to help fully implement it on campus. “Having students work on these kinds of programs is a great way to demonstrate the feasibility of what we can do,” Wood said. And getting students involved early on could pay off for Dowd, too. She said getting help from students like those in Wood’s class could also build a wider base of students who can then promote it. “That’s kind of something we’re hoping to do because it would engage a population that doesn’t necessarily focus on SA projects,” Dowd said. Two students from the School of Engineering and Applied Science currently serve on the SA Senate. The Division of Operations also made multiple changes to GW’s official app over the summer that focused on the 4-RIDE aspect of the program, University spokesman Kurtis Hiatt said in an email. Hiatt said students will receive a text message when their 4-RIDE has arrived to pick them up instead of just when one is on its way. Students can also now track the location of their 4-RIDE on a map of campus. Hiatt added that conversations about updating the GW app are “ongoing,” and said that multiple offices are working together to prioritize proposed ideas for the upcoming school year. “Additional enhancements to 4-RIDE functionality on the GW app are being discussed with the Student Association, and we look forward to working collaboratively on enhancements that may be possible this year,” Hiatt said. Dowd promoted safety and security during her campaign for president, including calling for emergency contact information to be put on the back of GWorld cards and improving 4-RIDE services by tracking the location of vehicles. Dowd and Syron have already met with University Police Department Chief RaShall Brackney to discuss more ways to connect with students during the school year. Dowd added that she also reached out to other top SA officials, like members of the SA cabinet, for their input on what should be added to the app. GW’s official app provides a directory to other GW websites and campus resources. Through the app, users are able to browse the student, faculty and staff directory, look up class schedules and access the bookstore. The revamped app will have a map integrated within the 4-RIDE section of the program, and students told Dowd they also wanted the Vern Express schedule included. Dowd said that most of the conversations she had with her cabinet were focused on making the GW app more tailored to students. This article appeared in the September 3, 2015 issue of the Hatchet.